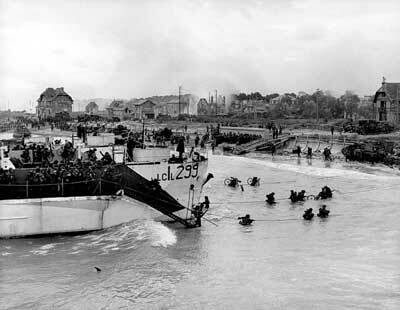 Canada was a full partner in the success of the Allied landings in Normandy (‘D- Day’). Determined to end four years of often-brutal German occupation, on 6 June 1944, Allied forces invaded Western Europe along an 80-kilometre front in Normandy, France. Of the nearly 150,000 Allied troops who landed or parachuted into the invasion area, 14,000 were Canadians. They assaulted a beachfront code-named “Juno”, while Canadian paratroopers landed just east of the assault beaches. Although the Allies encountered German defences bristling with artillery, machine guns, mines, and booby-traps, the invasion was a success. Other Canadians helped achieve this victory. The Royal Canadian Navy contributed 110 ships and 10,000 sailors in support of the landings while the R.C.A.F. had helped prepare the invasion by bombing targets inland. On D- Day and during the ensuing campaign, 15 R.C.A.F. fighter and fighter-bomber squadrons helped control the skies over Normandy and attacked enemy targets. On D-Day, Canadians suffered 1074 casualties, including 359 killed.